From flying over Never Land to taking a spin in a tea cup, Fantasyland has been home to some of our guests’ favorite experiences at Walt Disney World Resort since opening day. So when we set out to reinvent the most popular land at our most popular Disney destination, we knew that it had to be something truly spectacular – and I’m proud to say that New Fantasyland is exactly that. Last Friday, I toured the construction site as we complete the finishing touches for our official opening on December 6, and while the entire expansion is extraordinary, there are a few aspects in particular that I think will be huge hits with our guests. Part of what makes Disney Parks so special is our ability to connect people with the Disney characters and stories they love. With Enchanted Tales with Belle, we’re doing that in a magical new way. Guests will enter Belle’s cottage, step through an enchanted mirror and be transported to the world of “Beauty and the Beast,” where they’ll help Lumiere, Belle and The Wardrobe recreate “the tale as old as time” by becoming part of the story themselves. Our Imagineers have brought these characters to life in ways that are sure to delight guests both young and old. One of the hallmarks of a great Disney experience is the meticulous attention to detail that goes into the worlds we create, and the queue for Under the Sea ~ Journey of The Little Mermaid is another fantastic example of “the more you look, the more you see.” Before taking a voyage under the sea with Ariel and her friends, guests can explore the caves and grottos in and around Prince Eric’s castle, interacting playfully with Scuttle and a few of his friends along the way. The rockwork that’s been done is spectacular, and the paintings that adorn the vaults beneath the castle help draw visitors to New Fantasyland even further into the story of the beloved animated film. One of the most gratifying aspects of this expansion is the way that our new attractions, entertainment, merchandise and food offerings all come together to create a singular experience that is a worthy addition to a park as iconic as Magic Kingdom Park. The result is only possible through the hard work and the collaboration from people across Disney Parks and Resorts, and I am extremely proud of what they have accomplished. 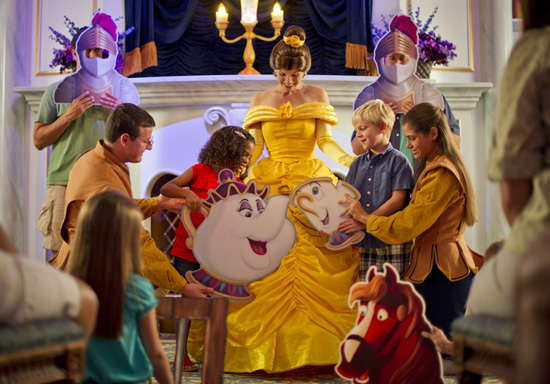 We can’t wait to take guests beyond the walls of Cinderella Castle to discover the new stories, new adventures and new magic that will help them make shared memories that last a lifetime.